Designed with the "cost conscience" contractor in mind, the Impactor 2000 is a Multi-Purpose implement,efficient at delivering, high-volume, deep-soil compaction, and various high-production pavement breaking functions. It is capable of compacting a diverse range of fill materials and in-situ soils, to densities unachievable by most conventional means. With one Impactor 2000 it is possible to displace several, more expensive compactors, resulting in reduced equipment inventory, operator, and fuel costs. Soil compaction and breaking of airport tarmacs, airport taxi-ways, roads, highways, and other flat work may be accomplished in record time. Pavement breaking applications include: Pre-Breaking for Removal or Recycling; Rubblization; Rebar Debonding and "Crack and Seat". 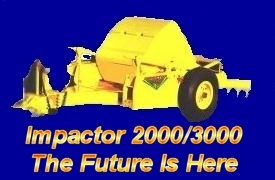 Compaction and breaking are performed by the Impactor 2000’s 19,000 lb., cam shaped drum. The induced rolling of the drum, resulting from the forward movement of the pulling unit, develops all energy required for compaction or breaking. At its optimum operating speed of 7 mph, the drum delivers 2 blows per second to the underlying surface. For compaction, the Impactor 2000 produces an estimated 22,000 ft. lbs. of energy with each blow, and during breaking delivers 30,000 psi of dynamic force. 2-miles of 2-lane Interstate Highway, made of 10-inch thick concrete. The Impactor 2000 is capable of reducing this to 18-inch pieces in less than eight man-hours. With an additional two man-hours, even greater reduction will be achieved. The pavements base and sub-base remains relatively undisturbed, while the pavement is reduced to its desired size. The surface left provides an excellent structure for rubber tired equipment to operate on, and tire damage is kept to a minimum. The Impactor 2000 may compact up to 48-inches of fill at once, giving it the capability to yield over six times the volume of compaction achieved through conventional means. While the Impactor 2000 produces higher densities with less effort, it helps eliminate failed tests and reworking. Quite often an Impactor 2000 may achieve densities five to six points higher than other compactors, making it the ideal compactor for high-spec projects. The V-Grader, a convertible blade/tooth drag, may be hydraulically lowered to provide smoothing or aeration of the surface. Through the use of the V-Grader, superior bonding of additional lifts may be accomplished. Hydraulic cylinders raise the drum for non-operating mobility, and trailering.. Whether using the Impactor 2000 or the 3000 for pavement breaking or soil compaction, the expenses saved through the high production gained, increase profits for its owner. Take a hard look at either of the Impactors today.